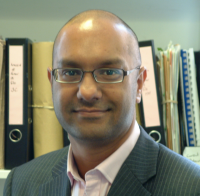 Bob Chatterjee is a fully fellowship trained specialist Spinal Surgeon treating all adult spinal conditions with the very latest techniques. Bob qualified from Guys and St Thomas’s Hospital in 1995. He completed research on Biomechanics and Skeletal Tissue Degeneration at the Royal National Orthopaedic Hospital in 2003, gaining a distinction for his thesis. He undertook specialist Orthopaedic Training on the prestigious Middlesex Rotation. In 2010, he was awarded a joint Neurosurgical & Orthopaedic Royal College Spinal Fellowship Training programme at Cambridge and Norfolk and Norwich Hospitals. He has a firm commitment to education both lecturing and teaching internationally in additional to being a faculty member on several educational courses. He is the author of several book chapters, articles and research papers in addition to presenting his research work internationally. He is currently the Consultant editor of three periodicals and resides on several committees. His passion for spinal surgery is evident in his consultations with clear explanations of both conditions and options for treatment. Bob is a member of the British Orthopaedic Association, AO Spine and British Association of Spinal Surgeons. 1) What's new in Spinal Surgery? My outcomes are continuously updated. My secretary during working hours. Out of hours: the hospital in which you were treated who will have my contact details.